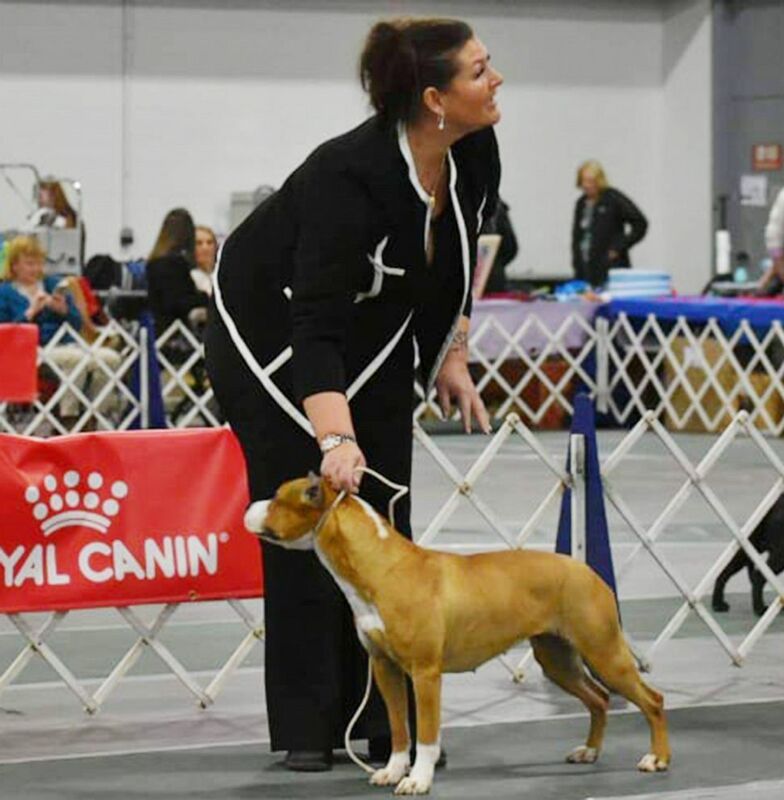 The prize-winning show dog that disappeared in one of the world's busiest airports for three days after being checked in for a flight has been found. Gale, a pure-bred American Staffordshire terrier whose owners live in Amsterdam, has been located and reunited with her family, the Hartsfield–Jackson Atlanta International Airport announced on social media Tuesday. The dog was being shown in the United States by her handlers and had one final event in Louisville, Kentucky, before she was scheduled to fly home Saturday. It was not immediately clear where Gale was found. A spokesperson for KLM Royal Dutch Airlines confirmed to ABC News on Tuesday that the dog was flown home to her owners. Gale's handlers had brought her and another dog to the Hartsfield–Jackson Atlanta International Airport on Saturday, where they checked in for their KLM Royal Dutch Airlines flight and went through security. Not long after the handlers boarded the Amsterdam-bound plane in Atlanta, they were informed that Gale's kennel was found empty when crews went to load her crate onto the aircraft. The handlers immediately called her owners. "Me and my wife completely panicked," Gale's owner, Floris Van Essen, told ABC News in a telephone interview from the Netherlands’ capital on Monday. "We were out of our minds. You can imagine it's horrific to hear that a dog is gone and nobody knows where she is." Van Essen said they've been in touch with the airport, the airline as well as the baggage handler, but being thousands of miles away and in different time zones "isn't helping." "There's a sense of hopelessness and powerlessness because there's nothing you can do," he added. The American Staffordshire named Gale is seen here in an undated file photo. Authorities and airport officials, including wildlife biologists on staff, had been trying to track down the dog ever since. "The dog somehow got out of the crate and is now running around the airfield," Andrew Gobeil, a spokesperson for Hartsfield-Jackson International Airport, told ABC News in an interview Monday. "We have about 4,600 acres of field out there, from the airfield and from the woods area. So we're looking throughout the entire airport." "We're optimistic that we'll find Gale," Gobeil added. "We understand how important the dog is to the family structure when we want to make sure that we get Gale home safely." A spokesperson for KLM Royal Dutch Airlines told ABC News the dog "broke out of its cage as it was being loaded into the cargo" of the plane. Gale's owners described the dog as "friendly" and "loving," but said she is likely scared and skittish in an unknown area. "We're really missing a family member," Van Essen told ABC News. "We don't have any children, the dogs are our children. Her brother lives here, her mother lives here, and we really want her back home safe." ABC News' Jeffrey Cook, Nicholas Coulson, Julia Jacobo, Janice McDonald and Marissa Parra contributed to this report.